Translated by Steven Rendall, Janet Roitman, Cynthia Schoch, and Jonathan Derrick. The concept of cultural identity has become for many a convenient explanation for most of the world’s political problems. In The Illusion of Cultural Identity Jean-François Bayart offers a sustained critique of this rationalization by dispelling the notion that fixed cultural identities do, in fact, exist. 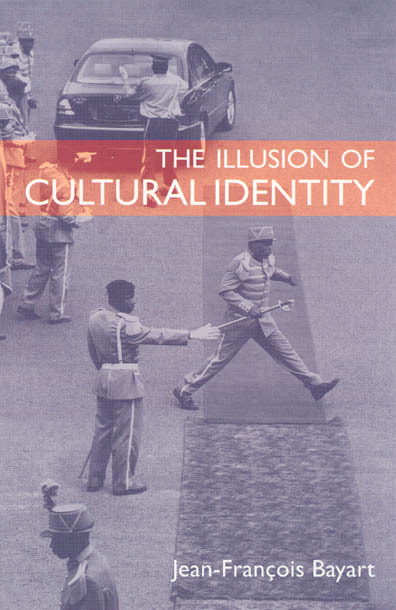 In this highly sophisticated book, Bayart shows that the very idea of cultural identity prevents us from grasping the cultural dimensions of political action and economic development. Identities, he argues, are fluid, never homogeneous, and sometimes invented. Political repertoires are instead created through imagined, highly ambiguous aspects of culture—what he calls "imaginaires." For instance, the long beards worn by men in some fundamentalist groups are thought to be key to their core identities and thus assumed to be in conflict with modern values. These beards, however, do not stand in the way of the men’s use of technology or their embrace of capitalism—an example Bayart uses to demonstrate the equivocality of cultural identity. The theoretical implications of Bayart’s analysis emerge from a fascinating collection of historical examples that often surprise and always instruct. Part I. The Beaujolais Nouveau Is Here! 2. Should we stop using the word ’Culture’? Tableaux of thought or tables of the law?